This cape is convenient for you dressing at home or take part in cosplay. Ships in 1-2 business days,all of the items offer tracking number.7-18 business days to arrive,expedited shipping available.30 Days Return Policy,100% Satisfaction Guaranteed. 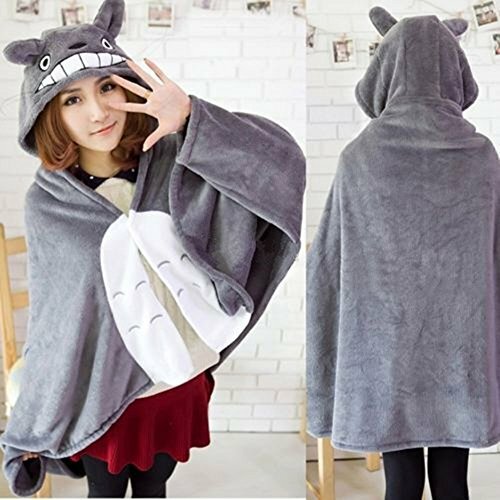 Totoro cosplay cloak cape hat with draping design,perfect for you to watching TV or surf internet. So warm and cozy… but not too big and heavy. This adorable Totoro Cape will keep your shoulders warm, and keep you happy. Pull up the hood if there is a breeze or drizzle. Of course, it’s absolutely perfect for curling up in at home!